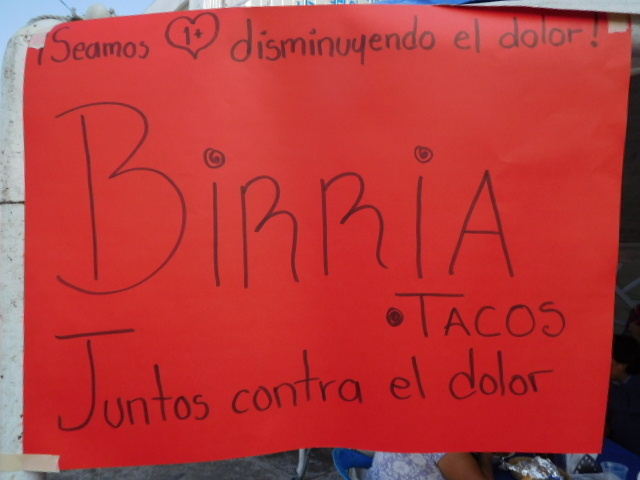 Juntos Contra el Dolor, A.C., the only 24-7 palliative care/hospice in Jalisco, Mexico, held a kermes to raise funds for its humanitarian medical effort which aides patients with chronic pain, and, at end of life. The Juntos team also provides psychological and spiritual support to families of patients. 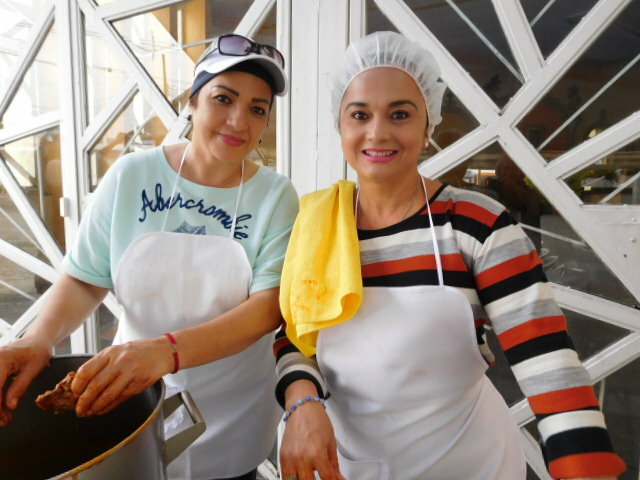 The kermes was held on a Sunday from 8 a.m.to 2 p.m. outside the Templo of San Bernardo on Plan San Luis in northwestern Guadalajara, a church with 3,000 parishioners. 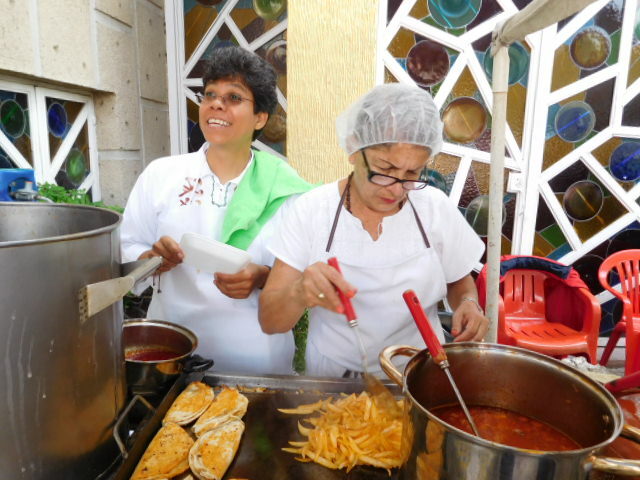 A Mexican kermes is an outdoor party for a special cause. To support the cause, people buy food and drink. 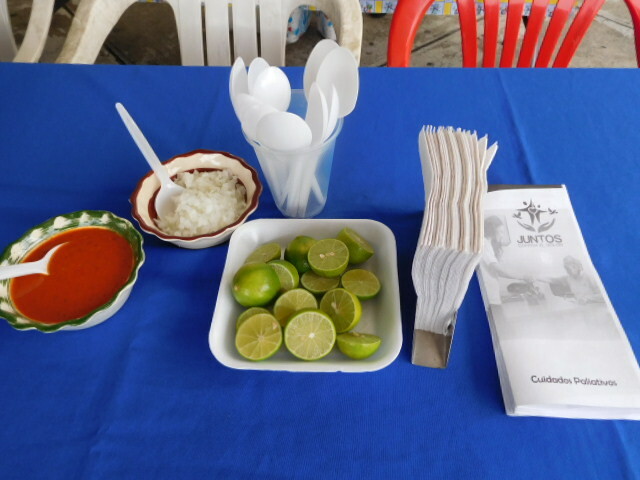 The Juntos kermes served tacos with birria, quesadillas, homemade jamaica (a hibiscus drink) and horchata (a rice drink). Juntos brochures were on each table. 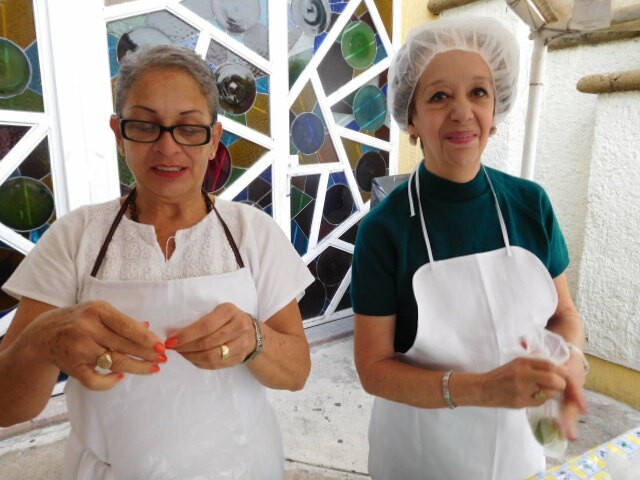 The nurses, who are the only paid staff (except for volunteer retired nurse Rocio), were taking care of patients at the hospital around the block.. The Spanish word kermes is derived from the Turkish word kermes which originally meant a handicraft bazaar to raise money for charity. It is also derived from the Dutch word kermesse, (kerk = church, mis = mass), a festival after mass. 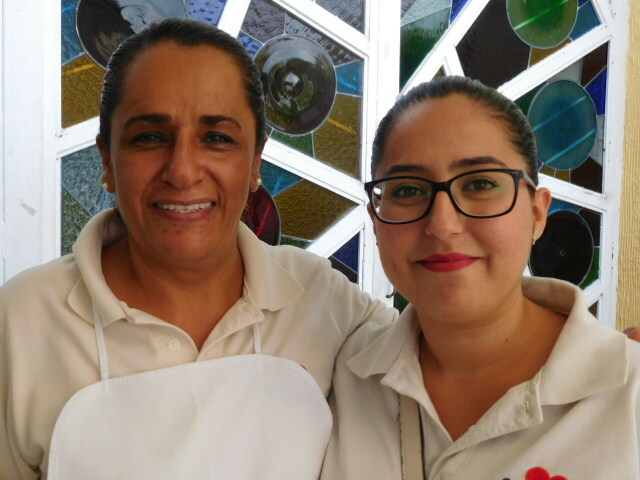 I have the honor of serving as an observer at Juntos Contra El Dolor (United Against Pain), a palliative care hospital and hospice in Guadalajara, Mexico. 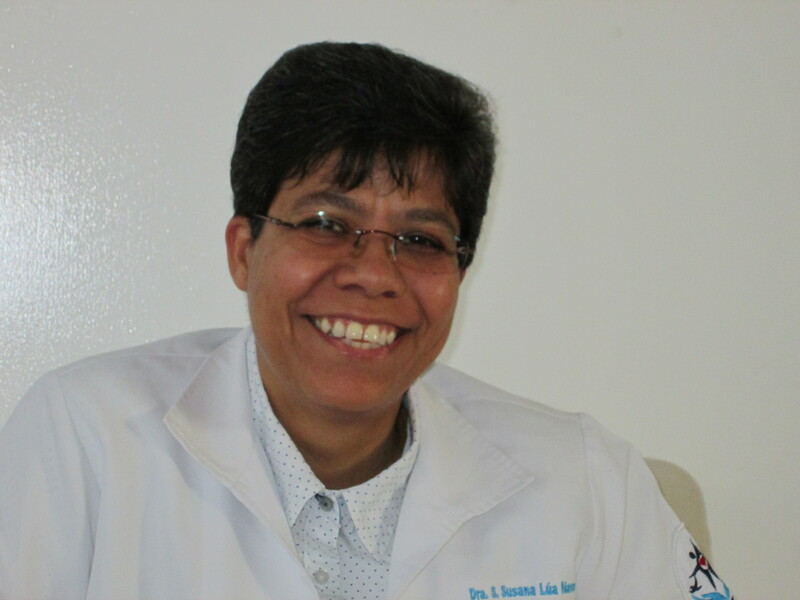 Its founder, Dr. Susana Lua Nava, is a graduate of the medical school at UAG (Universidad Autonoma de Guadalajara). She did further training in the Canary Islands with Dr. Marcos Gomez Sancho, considered a highly-regarded thought leader in palliative care. Dr. Lua, also a nun, is dedicated to creating an integrative model for Mexico which addresses the needs of not only the patient, but of the family as well. Her non-profit produces educational seminars on palliative care for both professionals and the public. 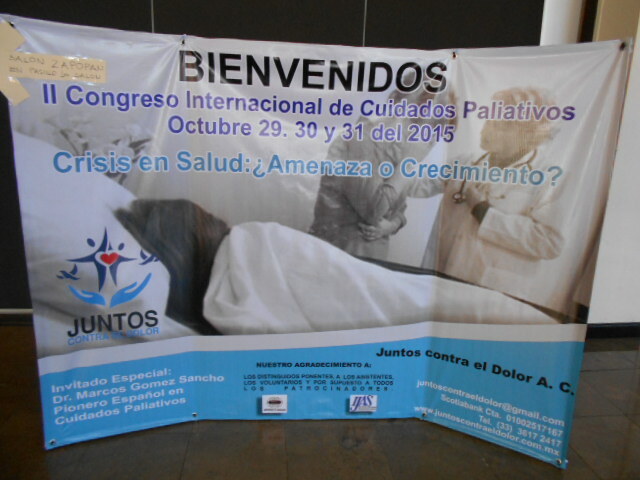 On October 29, 30, and 31 Juntos Contra El Dolor is sponsoring a 20-hour continuing education international conference at Expo Guadalajara entitled “Crisis en Salud: Amenaza o Crecimiento?” (Health Crisis: A Threat? Or an Opportunity for Growth?). 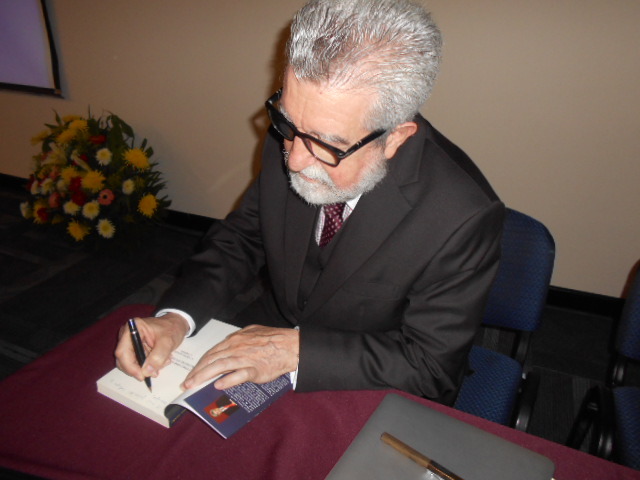 Pain management pioneer Dr. Marcos Gomez Sancho of Spain will focus on the “Culture of Death in the Latin World”, and “Dying in Peace.” Other themes include morphine vs. marijuana, the psychological struggle in patients with terminal diseases, how the family handles a crisis and makes decisions, interventions when pain is difficult to control, nutrition, and more. Juntos Contra El Dolor is located in the parish of San Bernardo (Mezquitan Country), known for its dedication to social justice. There is a day center for Down’s Syndrome children, a drug and alcohol live-in re-hab, a senior home, and the hospital. Juntos Contra El Dolor serves all regardless of socio-economic standing, religious preference, age, or race. See http://www.JuntosContraElDolor.com. Above is a photo of the Juntos team. Dr. Lua is in the center.